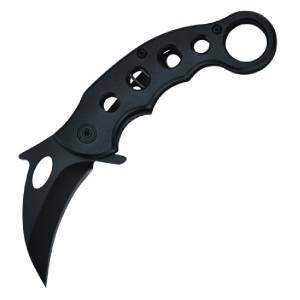 Milspec Karambit Style Spring Assisted Tactical Pocket Knife. Finger Ring 4" Closed, 2" Black 1065 Surgical Stainless Steel Blade. Black Aluminum Handle with Finger Ring. Includes Belt or Pocket Clip. Free Economy Shipping to all of the lower 50 US states! We will ship this item to P.O. Boxes & APO.